After an awesome 2013 we rolled up our sleeves, brushed the crumbs off our keyboards, and geeked out on some numbers. Why? Why not? Below is what we found. Enjoy. Below is a representation if you vertically stacked all the desserts made in 2013 next to the Empire State Building in New York. If you weighed all the cake balls we made in 2013 they would outweigh a Scion xB! That’s a lot of cake balls! We baked enough full size cupcakes in 2013 to fill an NBA basketball court more than four times. Where do our customers come from? 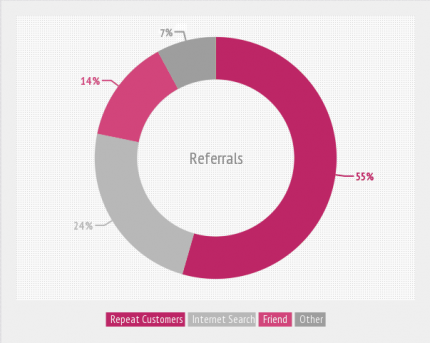 24% of our customers found us on the internet, another 14% heard about us through a friend. Over half our customers love us so much that they come back again and again! People love our deliciousness! Cupcakes are cool, but when it comes to weddings, cakes are 76% cooler. 139 guests is the average size of a wedding. That’s 278 eye balls watching the best man speech, no pressure. We served enough wedding cake to give a slice to everyone at a sold-out Honda Center game, with plenty of to-go boxes! Tiers are related to the amount of guests attending the wedding. Since 139 guests is the average wedding size it’s no wonder that three tiers is the most popular cake size. 75% of our brides prefer the curves of round cakes over it’s angular counterpart. Sheet cakes might save you a few bucks, but they shrink the overall cake size. 80% of brides prefer to make their cake as big and magnificent as possible. We’ve delivered cakes all over, but Fullerton is a magnet for our deliciousness. It’s never too early to book the wedding cakes. Most people tend to book them 92 days in advance. Enough people stopped by our website last year to fill Angel Stadium more than twice! Deliciousness is baked, iced, and boxed by a grateful staff of six. Thank you for a Great 2013! It looks like CUPCAKES are the clear winner! Mention this email when you buy a CUPCAKE and get the second CUPCAKE FREE! Not valid with other offers. Must be picked up on Feb. 13-14, 2014. Discounted limited to 4 cupcakes per customer. 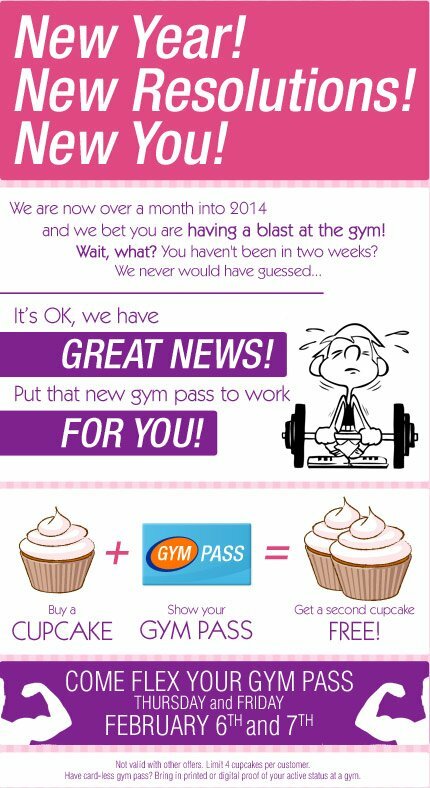 Buy a cupcake, show your gym pass, and get a second cupcake FREE! Come flex your gym pass, Thursday and Friday February 6th and 7th. Not valid with other offers. Limit 4 cupcakes per customer. Have card-less gym pass? Bring in printed or digital proof of your active status at a gym.